White can hane-connect with , , and then go back to patch up with . This is straightforward, and ends in gote. If black has a bigger move than , he can tenuki after . 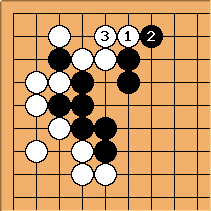 There isn't much aji left in either player's position after this sequence. White can protect with this . Black plays elsewhere next. Later, black can close the side, ending in gote. 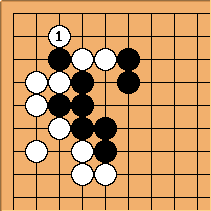 If white comes back here first later, he can still play the hane-connect, but this leaves slightly more aji in the position for black than in the 1) "play it all out" diagram. Is there a rule of thumb about how to deal with this kind of thing? Is it generally preferable to completely play out a sente sequence that ends in gote or are there occasions when it is better to take gote sooner and leave part of the sequence as an additional gote followup? unkx80: In the position shown in this BQM I would not recommend the hane-connect because it strengthens black. However, the Wu Ren Go game position has a slightly different surrounding context which merits the hane-connect. Perhaps I can say more during the game review.